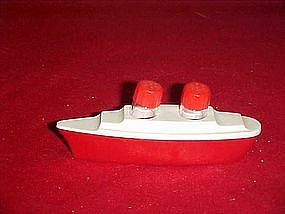 Vintage plastic/celluloid ship holds two glass shakers with plastic tops. Ship is 4 1/2" long and each little glass shaker is 1 3/4" tall. Great condition.